The Township of Bridgewater was set off from Jackson and Washington townships in the year 1895. A petition was presented to the board of supervisors in that year, signed by the citizens of the community, asking that all of sections 27, 28, 29, 30, 31, 32, 33 and 34 in township 75, range 33, be set off and taken from Jackson Township and that all of sections 3, 4, 5, 6, 7, 8, 9, 10 in township 74, range33, be set off and taken from Washington Township and be formed together into the new Township of Bridgewater. This petition was presented in January, 1895, and approved by the supervisors, with the order that same was to go into effect on January 1, 1896. This strip of land, in plainer terms, runs 2½ miles east and west and is one mile wide, one-half extending into each of the townships of Jackson and Washington. The town of Bridgewater had its start in the year 1885 by the building of the Chicago, Quincy and Burlington Railroad through that territory. The railroad company purchased the main site of the town from several gentlemen, their names and amount of land bought being as follows: From J. B. Sullivan, 80 acres; from George F. Clark, 20 acres; from Matt Lednun, 10 acres; and from Thomas Warrior, 10 acres. The plat was filed October 13, 1885. The name of the town was probably given from the fact that the railroad at this point had considerable difficulty in bridging the Nodaway River, being compelled to construct a bridge 640 feet in length. This origin of the name has never been verified, but is accepted as the most probable of all sources. The first store in the new Town of Bridgewater was started by S. F. Peterson. He came from a distance of six miles and installed a general stock of goods in a frame building constructed for the purpose. Mr. Wolford came from the east side of the county at the same time, if not shortly previous to Mr. Peterson, and also started a general store. K. R. Madden was the first man to open a hardware business in the young community and shortly afterwards E. Sulgrove purchased a partnership in his business. The Fisher Brothers, J. W. and J. H., were the next to start a general store. Soon after Andrew Thompson went into partnership with Wolford in the merchandise business. E. W. Regan was the first physician to locate in Bridgewater. Bridgewater was unfortunate in the first year of its existence owing to the untimely visit of a terrific cyclone, which came one night in the summer of 1886. The tornado was unheralded and swept its vicious course straight through the few houses in the town, doing considerable damage. The new 2-story residence of George Lilly was completely demolished and distributed over several square miles of territory. Mr. Lilly stated that he was going upstairs to bed, carrying an oil lamp when, suddenly, he found himself in the cellar. The Wolford store was blown off the blocks upon which it had been placed. In 1890 two church societies were started in Bridgewater, the Church of Christ and the Methodist Episcopal. Both churches erected houses of worship that year, which are in use at the present time. The membership of each is close around 150. There is a very good lodge spirit in the town and the different orders active are united in helping the destinies of their community. Perhaps the strongest organization is the Independent Order of Odd Fellows. The Modern Woodmen and Knights of Pythias have charters here, but are not very active at the present time. The Community Club, just recently organized, is a very strong factor in building up the town and township. This club is the same as a commercial club, differing only from the fact that it is formed so as to include the farmers in the adjacent territory as well as the citizens of the town. Their purpose is to accomplish everything which will benefit the country in which they live. Bridgewater is perhaps the chief live stock center of the county. A fact that testifies to this is that nearly all of the grain grown in the townships around is kept there and fed to the stock, which in turn is shipped to the markets. The shipping from this point is very heavy. The stock raised here comprises a large amount of prize and fancy animals. There are a number of dealers in this class of stock, in the adjacent territory. The Union Bank was organized on January 6, 1890, by J. G. Hendry and G. G. Rechtenbach, as a private bank. Rechtenbach died soon afterwards and Mr. Hendry became the sole owner, which position he continues in 1915. The deposits of this bank run to the amount of $200,000 and are protected by the interests of Mr. Hendry. The building in which the bank is housed was constructed in the year of its organization, costing $2,600. H. E. Hendry is the present cashier of the institution. 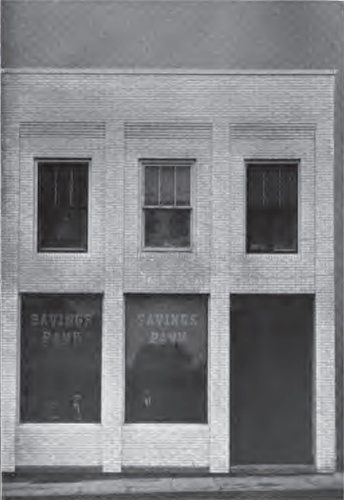 The Bridgewater Savings Bank was organized in August, 1905, by Messrs. Harlan, Turner and Castle, from outside points. The first capital stock was $10,000, the same being the amount at present. The deposits amount to $95,000 and $1,000 surplus is carried. The handsome bank building was built in 1914 at a cost of $5,000. The fixtures are worth $2,000 extra. E. Sulgrove is president of the institution; E. H. Sullivan is vice president; P. P. Sullivan, cashier; and F. R. Michael, assistant cashier. Both of these banks are on solid basis and are well patronized by the people of the vicinity. They testify to the financial strength of the community.